Muggles really get the short end of the broomstick. 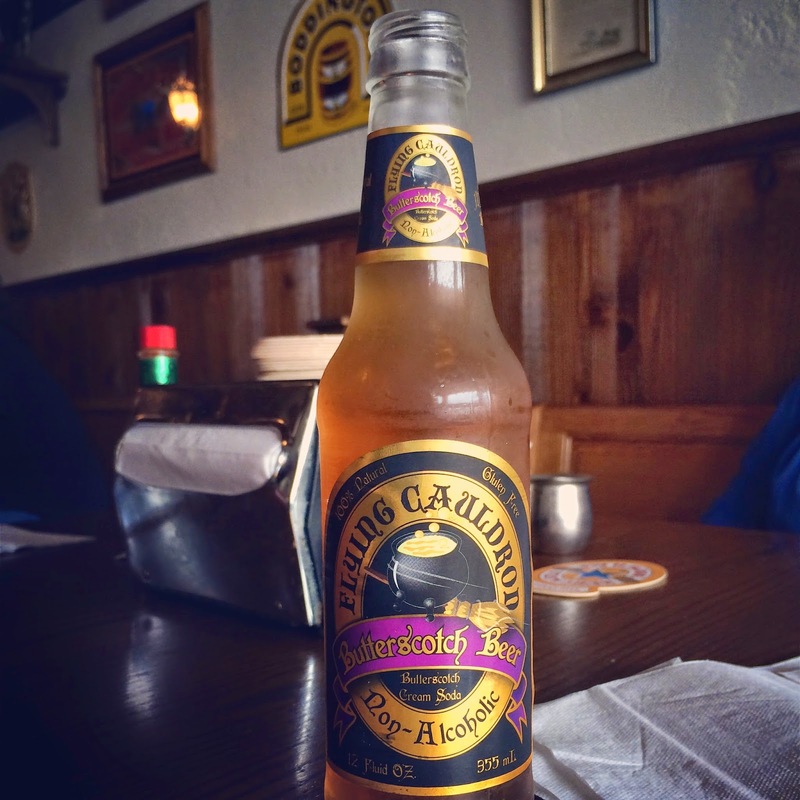 Not only do we have a total lack of magical abilities, we miss out on all sorts of other fun witchy things, including the refreshing, non-alcoholic beverage of Butterbeer. Sure, it’s served in The Wizarding World of Harry Potter over in the far away, possibly make believe* land of Florida. But, unless you have some Floo Powder lying around somewhere, chances are you won’t be enjoying it with any regularity. That was until now. Meet the delicious, totally-not-copyright-infringing elixir called Butterscotch Beer from the Flying Cauldron (A.K.A. Reeds, Inc.) brewed in *cough* *cough* Hogsbreath, England. I’ve tasted it and it’s fantastic. I swear I caught this guy giving me the side eye when I asked for half shrimp/half fish with the Butterscotch Beer. I popped down to Camelot in Pacifica, California this weekend for a proper English wizard’s lunch of fish and chips and what did my wondering eyes did appear advertised at the front counter? Why, an announcement for Butterscotch Beer. 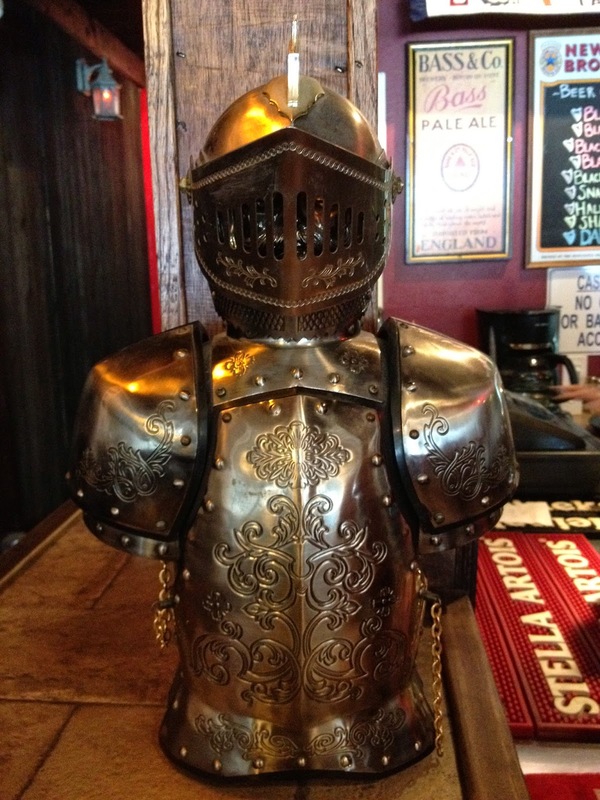 You know I had to order it, intellectual property rights be damned. It was served ice cold and in the bottle, so there was no head of foam as described in the books, but it was just as yummy as Rowling intended. It smelled and tasted exactly like butterscotch without being cloying. The drink was lightly effervescent and, thankfully, not syrupy. Online reviews from countless muggles on Amazon say it’s similar to what’s served at the theme park sans the cream topping. I was also pleasantly surprised to see the ingredients on the back were free of the normal laundry list of unpronounceable components of most sodas. While Butterscotch Beer wasn’t the best drink to pair with fish and chips,** it would be fantastic on its own as a treat or part of an ice cream float... Dammit. Now I want an ice cream float. Right, where was I? If you’re lucky enough to live in the Mid-Atlantic, you can pick up a case at your local Wegmans. For those of us roughing it everywhere else in the country,*** you can order it online at Reeds, Inc. And, of course, if you live in the San Francisco Bay Area, you can always grab it along with some pub grub at Camelot in Pacifica. It’s the perfect addition for Potter parties and a great present for HP fans. *What? I’ve never been there. How am I supposed to know for sure it’s real? ** And who’s fault was this ghastly combination, Megan? Yours. ***Shhh! Don’t tell Meghan B. that I at all insinuated the East Coast might be better than the West Coast for any reason whatsoever. We’ve been having this argument for YEARS and I don’t want to lose any ground. Anyone near Salem, MA can pick it up at the local all-things-HP emporium, "Remember Salem" on Essex Street too. (Those of us who work nearby don't abuse that option at all...) It's right next to Wynott's Wand Shop. Seriously. I... I want to go to there.